non-comedogenic, hypo-allergenic, and fragrance free. It can be used everyday, even hot summer days. 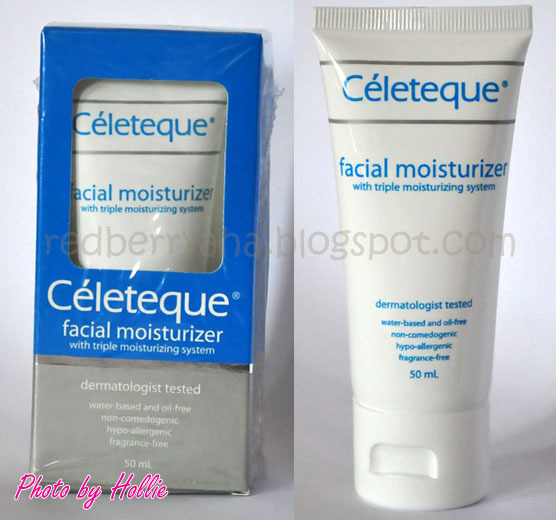 I have been using the Celeteque facial moisturizer for 3 weeks now and I'm very happy with it. I already have the Celeteque facial wash and have been using it for months so I figured, why not try their moisturizer as well. You can check out my detailed review on the facial wash HERE. * I have dry skin, so it's not as moisturizing as my Cetaphil moisturizer which I love to use at night before bedtime. But I would really recommend this to anyone. Overall I can say that this is a good everyday moisturizer. I will probably repurchase this. Before I tried this product, I was using the Myra E facial moisturizer and have been using it for years. I just thought I'd try something new and I'm glad that I found another product with similar quality. There is just one thing that I noticed though, this is much milder than Myra E which makes it even better. great review. :) i always see this on watson's but really haven't tried it. btw, i am having a giveaway on my blog. ^^ will appreciate if you can join. thanks! @sugar, Thanks. Sure, thanks for inviting me to your giveaway. @Sara.H, Thanks. I followed you back. @xNTA... I'm really sorry that this is not availabe in your location. Oh my gosh, Hollie! I used Celeteque facial wash and moisturizer when I was 16 and I got depressed because after three days of using their products, I broke out. It was so bad that I didn't leave the house for a month and my aunt who's a Dermatologist needed to give me a ton of treatment. I'm so glad my skin cleared up just in time for the beginning of school! uhm im i bit confuse about how to use it.. is it after u bath or when your taking a bath???.... are you still using this product??? @Anonymous, You use moisturizer after your bath. and yes I still use this.